Nemesis (n.) 1) An opponent or rival whom a person cannot best or overcome. 2) A person's undoing. 3) Joshua Templeman. Not dislike. Not begrudgingly tolerate. HATE. Lucy can't understand Joshua's joyless, uptight approach to his job and refusal to smile. Joshua is clearly baffled by Lucy's overly bright clothes, quirkiness, and desire to be liked. Now they're up for the same promotion and Lucy, usually a determined people-pleaser, has had enough: it's time to take him down. But as the tension between Lucy and Joshua reaches its boiling point, it's clear that the real battle has only just begun . . . This bestselling, laugh-out-loud romantic comedy is an unmissable, utterly loveable treat and is perfect for fans of Sophie Kinsella's MY NOT SO PERFECT LIFE or Jo Watson's LOVE TO HATE YOU. Sally Thorne lives in Canberra, Australia and spends her days writing funding submissions and drafting contracts (yawn!) so it's not surprising that after hours she climbs into colorful fictional worlds of her own creation. Sally believes that romance readers are always searching for intensity in their next favorite book - and it isn't always so easy to find. 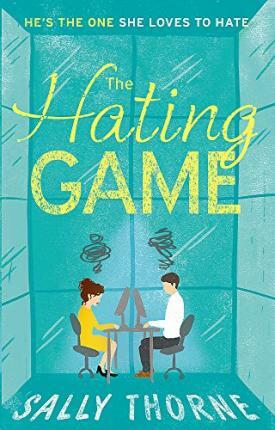 The Hating Game is her first novel.